Import your flight data from Roster Buster – New function in FlyGo Pilot Logbook - Flygo-Aviation Ltd.
Are you familiar with Roster Buster? Or you already use it? Then we have great news for you! If you also use FlyGo’s Pilot Logbook you can import all flight information from Roster Buster. Sounds great? Then try it and enjoy the benefits of synchronizing your flight logs easily. Keeping track of flight logs is one of the main time-consuming administrative tasks for pilots. Even if you are a private pilot or a commercial pilot, you also face with the challenge of managing these information. Since electronic flight bags (EFB) are getting more and more popular among pilots, there is an increasing demand for apps and technologies that transfer information among devices. If you are not familiar with Roster Buster, then let us introduce it how you can benefit from it. Roster Buster is the #1 Cabin Crew App on the aviation market and it supports more than 400 airlines worldwide. Pilots can download their airline routes to their mobile device used for aviation and create statistics about their flight routes. The app allows you to keep track of the current destination and arrival airports, countries and regions visited. It is compatible with the most calendars, pilots can chat with the crew, get automatically set reminders and much more. It also supports weather forecasts as well. By the way, do you know that we also have an iOS app for weather forecast? To sum up, Cabin Crew App is used worldwide and most ATPL pilots use it regularly. FlyGo team believes in continuously growth and improvement. Receiving feedbacks from our users we regularly review their suggestions and develop our apps based on their needs. FlyGo Pilot Logbook app is designed to make filling and editing flight logs easier and to save time for pilots. This aviation app has some practical functions as well. The Pilot Logbook is fully international and approved EASA and FAA requirements, it has offline data about more than 50.000 airports. The app has an adaptive structure which allows the pilots to track anything the want as they want. There are some functions within the app, such as the auto-fill function and the intelligent search function. The stored flight data is compatible with the major database applications (Excel, Numbers, Libre office etc.) and you can directly print your flight data according to FAA or EASA requirements. The application saves all data and settings on your device and you can backup or restore them on any iOS device via mail or iCloud. As a new feature, FlyGo’s Pilot Logbook is now compatible with Roster Buster. FlyGo is among the firsts worldwide that provides such integration for it’s users in aviation. 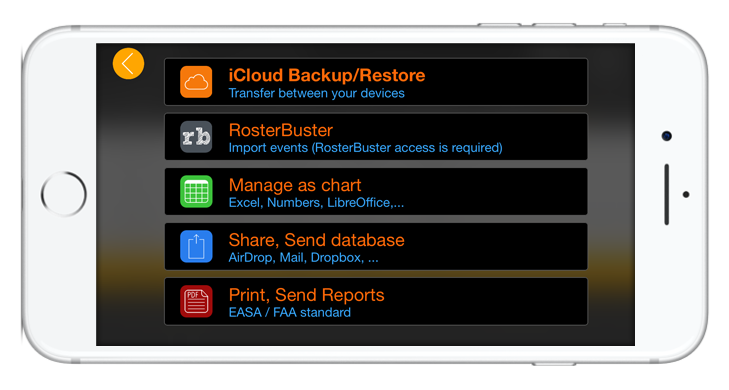 So, you can now import your rosters to our app anytime and keep your flight data in one place! With this app integration you can completely manage your routes, statistics and all of the data according to your flights. Once you synchronized roster, you can fit it to your already avaible flight data or create a new session. Do you use Roster Buster but never tried our Logbook? Download Flygo Pilot Logbook on the Apple AppStore and enjoy the limitless features of data integration. Save time and fly more!